For months I have been hearing about the DVD -- Capturing the Light: The Dorothy Izatt Phenomenon and thinking I should get a copy. 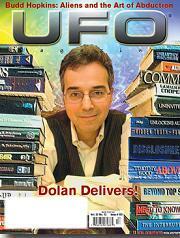 Recently my friend Alfred Lehmberg wrote about it for UFO Magazine and finally I ordered it and last week I watched it. To be honest, I don't believe I had heard of Dorothy Izatt before this DVD came out, but I learned from the DVD that she has been around for years and was investigated by J. Allen Hynek. Hynek believed in her films and it seems the two were friends or at least friendly. At first, looking at her frame captures from the original films made me think they were just planes or some other explainable light in the sky and she had not been holding the camera steady, causing the light to smear. That was until I got the DVD and realized that what I thought was a light smear was only visible in 1 frame of the film. I am not a very good photographer/videographer, but I do know a lot about filming and I know that it would be virtually impossible to have such a smear on only 1 frame. Of course, there is also Dorothy Izatt herself. Here is a lady that has been filming such things from her beautiful home in the mountains of Canada since the 1970's. Obviously not someone who seeks attention since I had never even heard of her before the DVD. A soft spoken and nice seeming woman. A mother and grandmother. A normal woman in every way except for these lights she keeps filming. I find it impossible to believe there is any deceit coming from her. I found it very interesting that some in Dorothy's own family seemed to think, not that she was lying, but that she was somehow misinterpreting things that she was seeing or even hallucinating. However, those same people seemed to change their minds when something remarkable happened while filming the documentary. There is a part where they are interviewing Dorothy's daughter in front of a window in the kitchen. Behind her during the interview there are lights moving, stopping and moving again and something that looks like a large UFO shows up. Then there are the orbs, but you would have to actually see the DVD, I don't think I could properly explain that part. None of this was noticed during the filming because obviously they were concentrating on Dorothy's daughter and paying no attention to what was going on outside the window in the night sky. Later, they bring this film back for the entire family to watch. One of the skeptics of the family rushes out after it is over to drive his car on a road back behind the house and tells the family to watch for his car lights. No lights. Impossible to see them from the house. The only other things visible outside that window are mountains and trees and even they aren't really visible at night. I do have some minor complaints about the documentary: 1) I would have liked to have seen much more of Dorothy's films. She has been filming for 30 years, she must have a vast collection. 2) I would have liked to have heard more about her actual contacts, which I believe are mostly (if not totally) telepathic and what she was told by these beings. There were a some mentions of the contact, but I was never sure if those were the only contact experiences (as far as them speaking to her) that she had. Of course, the film left me contemplating many things. I was left wondering if even I (hard as it is to believe) sometimes might ignore or not comprehend something for the truly amazing thing it may be. After all, some people may have looked out their window and seen a light, but explained it to themselves as a star or plane and walked away. Thereby, missing something amazing that happened only a second later. Others might comprehend, but be frightened, close their curtains and go hide in bed under the blankets. Many others may never act on the urge to actually look out the window and never see anything. Just maybe, all of us are confronted by miracles and wonders every day and we are just too busy and/or too self absorbed to notice them. Lesley is also a monthly columnist for UFO Magazine, writing the popular column Beyond the Dial.